I haven't told you much about my dog Blue. 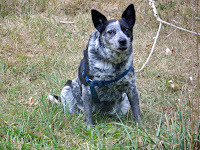 Blue is an Australian Cattle Dog (known as ACD). She's twelve years old and has been with me since she was a puppy. Before Blue came to live with me, something was attacking the cats on the farm. I was outside in the barnyard one day when the attacker got into a fight with my alpha cat. I heard the high pitched cries and ran to the rescue. I saw the spotted attack dog and chased him away. Unfortunately, he ran across the road toward the pasture where he lived in an underground den. He was hit by a fast moving truck and spun, on his back, half a mile down the road. I tried to get help from the truck driver so I could run for a blanket, but the driver took off and so did the dog! 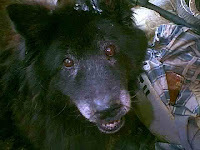 I figured if a dog could survive being hit on that road, that was the kind of dog for me. Over the years, I had lost a lot of pets to the speeding drivers. 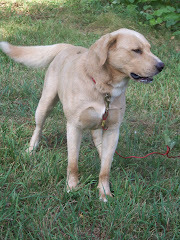 A woman who had been feeding horses and giving riding lessons on the farm had the most beautiful dog I had ever seen. 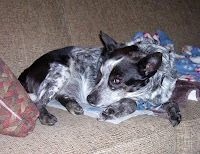 He was about the size of a dalmatian, but had ACD coloring and was supposed to be a cattle dog, so I had already learned a little about that breed and I recognized the spinning dog as an ACD. The breed had been developed to be tough enough to herd cattle by jumping right at them and maybe speeding trucks aren't too much tougher than an angry bull. People who breed and show Quarter Horses seem to collect animals that are the "in" animal to have. The "in" dog for a long time had been the Australian Shepherd, and I really enjoyed watching the cowboys walking around with those blue-eyed dogs following at their heels, but a new breed, the ACD, was moving in on the Aussies. Once a year, there's a huge ten day American Quarter Horse show in Columbus, Ohio. I had made it down to that show for at least a few days for twenty years, but in 1996 I was still teaching school, running the farm with a little help, and running the antique shop in Hamburg by myself, so I knew I couldn't go to the show. Two years before I had brought a wonderful little mixed breed puppy back from the show and that puppy had been killed on the road. I had several beloved dogs, but I felt that I was short one dog, knew my new dog should be an ACD, and I knew there would be ACDs for sale on "Puppy Alley" in Columbus. So, of course, I went to the show - four hours to drive down, one hour to choose the very appealing runt of a litter, and four hours home. Blue joined a pack that included Shady Lady, a French Malinois who had come to me years earlier because she had a death sentence in another county for chasing deer, Shady's son Shep who was half Lab and the kindest dog to ever walk the earth, and Ben who was a tough black mutt, sort of a terrier street dog type, and my Lifetime Dog. Blue joined the pack but never really became part of it. Shep and Shady were both way too old to play with a puppy and Ben was too busy running and hunting and going everywhere with me. Blue really didn't come into her own, meaning doing the job she wanted which was being my main dog, until the other three died of old age. Shady at 17 years old. 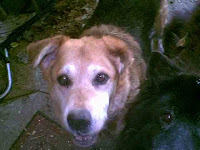 Shep at 16 years old. There was another dog who was not part of the pack. Spot was aloof with the other dogs and was his own pack. Spot was a Border Collie who was waaaay too smart. My furnace at the farm exploded and filled the house with soot, so I moved myself and all of the dogs to live in my studio above the antique shop. Spot escaped constantly. One day I got a call at school that he was loose and had been rescued by a neighbor's mother, who had been sitting with him in front of the store for hours. Several times, he broke through the antique doors in the store building, and took Blue with him out into the countryside. He took her a long distance and then would run off and leave her. One time, he left her in a frozen pond half a mile behind the store. Luckily, I found her in time. Another time, down at the farm, he took her more than twenty miles away. A distant neighbor and I tracked him all night. That time, she was only found because I had told another distant neighbor about the dogs and that neighbor had called her daughter. The daughter's neighbor had just told her about this lost dog who had turned up covered with ice on her porch. Spot was obviously trying to dispose of Blue. When Blue was only ten months old, she surprised everyone by delivering a litter of six puppies. I had never noticed that she'd even had her first heat cycle. Later, we realized that both Ben and Spot had fathered the puppies. When I was working downstairs in the antique shop, I didn't want to leave the puppies alone upstairs, so I started putting them in an antique beach baby cage - a big wooden and screened in box on wheels. On warm spring days, I rolled the cage outside and parked it in front of the store window. One such Saturday when the puppies were five or six weeks old, all of a sudden, customers started begging to buy the puppies - and I started selling them. Shady had been a mother three times years earlier, with a total of 36 puppies, which I mostly gave away to good homes, but selling these puppies was a pleasant surprise - a surprise which eventually led to George and Patches joining the household - I'll try to tell the rest of the story in my next post.